Introducing solid foods to infants can be an exciting and fun time in the lives of new parents. Babies make the best faces when they try a new food! It can also be a time of anxiety for many parents, particularly when they consider the potential for food allergy reactions. According to consumer research conducted on behalf of the National Peanut Board, many new parents are unaware of recent guidelines from the National Institute of Allergy and Infectious Diseases (NIAID) that recommend introducing peanut foods as early as 4-6 months, depending on risk, to prevent peanut allergies. But because early introduction is a powerful tool to help reduce risk (reducing risk of peanut allergy by 81% in those at high risk), parents need to understand when and how to introduce peanut foods. Group 1 includes infants who have severe eczema and/or egg allergy and are considered at highest risk for developing peanut allergy. Babies should be evaluated by their pediatrician before introducing peanut foods at around 4-6 months. Group 2 includes those at moderate risk infants have mild to moderate eczema and no known food allergies and should begin peanut foods with or without evaluation at around 6 months. Group 3 is comprised of those without eczema are considered at low risk and should begin peanut foods around 6 months of age. The recommendation for introduction has one more important component. Not only is it important to introduce early, it’s also important to feed peanut foods to babies often. The NIAID guidelines recommend infants be fed 2g peanut protein three times per week for a total of 6g peanut protein each week. Two grams of peanut protein is equivalent to two teaspoons of peanut butter. Now that we know when to introduce peanut foods and how much to give, the next consideration is how to do it safely. Many foods can be choking hazards for babies and young children. Whole peanuts and spoonfuls of peanut butter fall into that category. But, peanut butter can be thinned with liquid, such as breastmilk or formula, or mixed into cereals or purees to make it safer. Convenience is definitely an important consideration and can help make the process of introduction easier. Puffworks baby is a simple, easy-to-eat way to feed babies peanut protein. The crunchy, melty texture is perfect for teething babies and each individual serving has been carefully crafted to provide 2g peanut protein. Families can incorporate Puffworks baby into their diet including other peanut-containing foods or may choose to give baby three individual serving-sized bags each week to meet the recommendation. 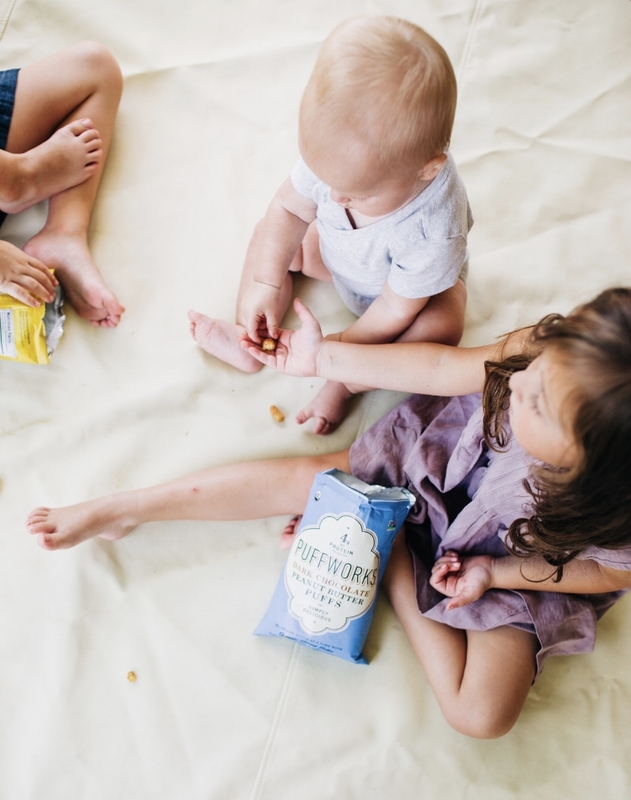 With no added sugar and minimal salt, Puffworks baby is a nutritious snack for infants and toddlers. - Sherry Coleman Collins, MS, RDN, LD is a registered dietitian nutritionist and consultant for the National Peanut Board. She is a nationally recognized expert in food allergies and a sought-after nutrition communicator. Follow Sherry at @PeanutRD on Twitter and Instagram.